When Mandi likes a thing, she needs more of that thing in whatever form she can get it. 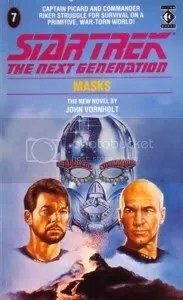 Before discovering Star Trek fanfic, it were the official novels. At one point she had the entire set. I’m a bit different when it comes to my fandoms. I tend to only enjoy the original iteration. With films I often don’t even feel the need to see the sequels. Though, of course, I eventually do. I just don’t feel the need. For me having that one perfect movie or book is enough. So I generally don’t wait in baited anticipation for movie adaptations of my favourite books and reading about the Star Wars Expanded Universe never appealed to me (though I did dip my toe into the Thrawn graphic novels). The same has applied to Star Trek books. I have more than enough Star Trek to watch and re-watch, why would I need, what I assumed were poorly written, novels on top of that? But with Star Trek there’s a few extra Nerd Hurdles I needed to leap. Yes, the assumption of simplistic, cheesy writing is at the top of the list, but it’s due mostly to some of the worst book cover art outside of Harlequin romances. Take Masks for instance. Floating heads over a volcano. And not just the usual nicely blended floating heads you might see on a movie poster, but these look like they were torn from another book cover and pasted on as an afterthought. Picard looks okay but what’s with Riker’s expression? He’s looking both drunk and constipated. I suppose that fits with my general feelings about Riker as a character anyway. Not the wall-eyed drunk so much but there’s something stuck up somewhere within him. Which is one of the reason’s I’ve never jumped on the Star Trek bookmobile. They seem generally Riker intensive. They were also lined up on one of my highschool buddy’s shelves along with his Dragonlance books. Forever the two series have been intertwined in my subconscious. That’s not exactly true. They’ve been intertwined in the forefront of my consciousness, no “sub” about it. I imagine I don’t need to explain Dragonlance books are a hurdle for me on principle. So what did I discover about Star Trek novels during the course of this rather tangent-intensive episode? You’ll have to listen (link at the top of the post) to find out. Notes: I have since read up about Oliver Cromwell and the Princes in the Tower on Wikipedia. So there’s no need to school me on English history. Well, there is a need. But not about those two particular subjects. Mandi doesn’t like robots. Jakob is a robot. Data is not a robot, he’s an android. The Evil T-1000 is lame.